The 21-year-old Japanese star overcame the seventh seed 6-2, 4-6, 6-4 to reach a second straight Grand Slam decider after her breakthrough triumph over Serena Williams at last year's US Open. 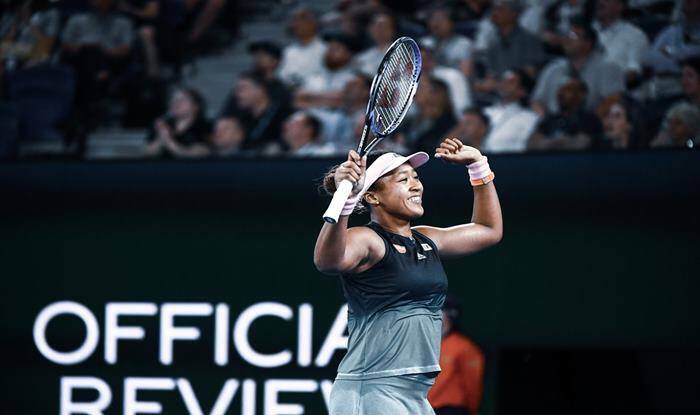 Australian Open 2019: Fourth seed Naomi Osaka outgunned Karolina Pliskova to set up an Australian Open final against Czech eighth seed Petra Kvitova. The 21-year-old Japanese star overcame the seventh seed 6-2, 4-6, 6-4 to reach a second straight Grand Slam decider after her breakthrough triumph over Serena Williams at last year’s US Open. Osaka started strongly to take the first set as the match began with the roof of Rod Laver Arena closed amid sweltering temperatures exceeding 36 degrees Celsius (96.8 Farenheit). But Pliskova, who ousted American great Williams with an epic comeback to make the semi-finals on Wednesday, roared back in the second before Osaka edged past her in the third. “I expected it, I expected a really hard battle,” Osaka said of Pliskova’s attempt to come back from a set and a break down. “I just told myself to regroup in the third set and try as hard as I could no matter what, and I managed to win.” She said her win at Flushing Meadows helped settle her nerves against the never-say-die Czech. “I was so scared serving second serves, I was like ‘oh my God, please! '” she said. “I guess that’s experience, I don’t know. Osaka is bidding to become the first woman since Serena Williams in 2015 to win the US and Australian Opens back to back. She will also become the new world number one, replacing Romania’s Simona Halep, if she beats Kvitova in the final. Pliskova was the bookies’ favourite for the title after her effort against Williams but made a slow start, hitting only four winners to Osaka’s 16 in the first set. The fired up Japanese also dominated on serve as she ended Pliskova’s 10-match winning streak. After blasting down an ace in her first service game, Osaka carved out three break points on Pliskova’s serve. A blistering backhand gave her the advantage following a baseline slugfest with the Czech. Pliskova double faulted to hand Osaka a second break and the Japanese star went on to serve out the set with an ace after 32 minutes. The opening four games of the second set all went against serve as Pliskova threw everything at Osaka trying to find a way back into the match. Osaka absorbed the pressure and continued to play her shots as the dogged Czech went on the attack. She held on until two unforced errors, trailing at 5-4, handed a jubilant Pliskova the second set after 41 minutes. Osaka managed a crucial hold as the third game of the third set turned into a seven-minute arm-wrestle, fending off three break points. She then broke in the next game but Pliskova continued to press and the Japanese player had to see off break point with an ace before serving out the match. She hit another ace on match point which was called out but successfully challenged the decision to ensure she made the final.